A new store installation project by architects and interior designers has started in the Home Collection section at DIESEL in Tokyo, Japan. The innovative installation called “DIGIT” was created by Yoshimasa Tsutsumi, an architectural designer based in Beijing. What on earth does it mean to “show things”? This simple question is the one we need to ask ourselves in order to realize a display of merchandise and spatial installation at the same time. Generally a room is surrounded by hard substances, to which we fix things in one of the following three ways: we place them on it, hitch them to it, or hang them from it. But a flexible wall with plasticity would give rise to a fourth way, i.e. burying them in it. Like a cave dug in a cliff, or fossils hundreds of millions years old trapped in lava, when something is buried in another entity, it constitutes an inseparable whole with the background. If we apply this to the shop display, we should be able to develop a new display method where goods and space are fused with each other. To create a plastic wall, we have devised drawers made small to the limit and piled them in huge numbers. Considering cost, time allowed for the project, and weight, led us to use paper square pipes 40X40mm in diameter for the main body and 35X35mm in diameter for the drawers. To fill the gap between drawers, the 40X40 pipes are fixed onto the front edges and the opening in those pipes are filled with cardboard in the front. 10,000 set of drawers with this tiny slide mechanism will be prepared, which will cover the whole wall. They can be used in any way possible. They could be like glyphs when three-dimensionality is emphasized, like an inlay when flatness is focused, and even “corroded” with light. 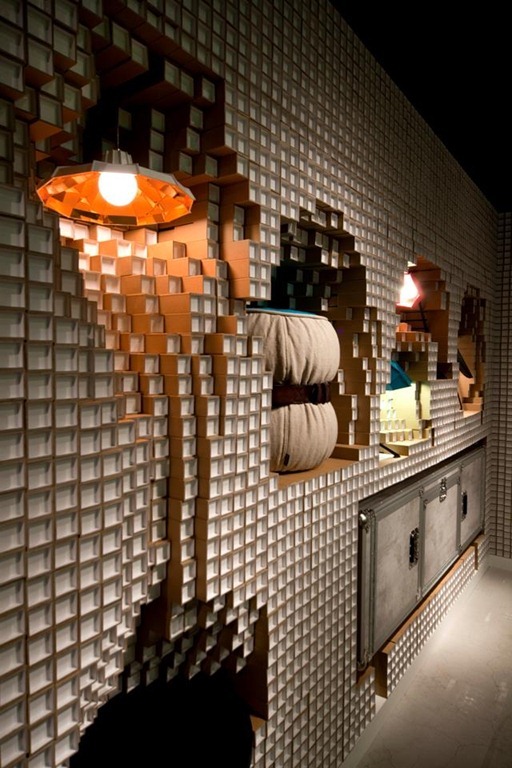 This is a DIGITAL wall made of tiny squares which people can just DIG IT their own way. Possibilities for display are infinite here, as is our imagination. Independent writer, curator, and coordinator specializing in art, design, and architecture. Contributes to various magazines including FRAME, MARK, and other publications. Author of many books and presiding director of a website for architecture. Diesel Home Collection “Successful Living from DIESEL” is built around a rock ‘n’ roll and casual living concept, which incorporates Diesel’s trademark style and attitude. In collaboration with Moroso for furniture, Foscarini for lighting, and Zucchi for textiles, the collection is highly recognized with its designs as well as its quality.